Natural Gas Company EQT said it will sell its Sunrise Pipeline Unit to EQT Midstream Partners LP for $507.5 million in cash, and $32.5 million of common and general partnership units. EQT Midstream, controlled by EQT Corp, provides transportation and storage services to EQT, as well as to other companies. Sunrise Pipeline LLC’s assets include a 41.5 mile pipeline between West Virginia and Pennsylvania, a compression station and an interconnect with the Texas Eastern pipeline in Greene County, OH. As it adds more capacity to the compressor station, EQT Midstream has also signed an agreement with another producer for about a quarter of the capacity on the Sunrise system. That arrangement is scheduled to begin in December 2014 and when it does, EQT Midstream will pay another $110 million to EQT Corp. The federal government gave the green light to a proposal to build 234 miles of gas pipeline to transport natural gas liquids from one corner of New Mexico to the other and ultimately to markets in South Texas. News of the pipeline’s approval encouraged oil and gas developers in New Mexico, which is home to portions of both the Permian and San Juan basins. The project will transport natural gas liquid products from northwestern New Mexico to a hub in Hobbs in the southeastern corner of the state and ultimately to Texas. AUBURN, Ala. — County officials in eastern Alabama are set to discuss a proposed natural gas pipeline that would cross through parts of Alabama, Georgia and Florida. Lee County commissioners are scheduled to meet Tuesday night to discuss the proposed project by Sabal Trail Transmission, a subsidiary of Spectra Energy Corp.
Logan Gray, a partner at Southern Strategy Group in Montgomery, is scheduled to give a presentation at Tuesday’s meeting, The Opelika-Auburn News reported. The interstate pipeline system would cover an estimated 465 miles across portions of the three states, the Opelika newspaper reported. A report on the project states that the plan is a response to a request for proposals from Florida Power & Light Co. to provide natural gas transportation for its power generation needs by May 2017. The estimated $3 billion project is currently in the early developmental stage and that FPL would likely award the project by July, according to the report. It also noted that Sabal Trail would seek out community response to the project as well as performing surveys to collect information. MATCOR is a leading provider of ISO 9001:2008-certified cathodic protection products that project many pipelines across the Gulf Coast region. Learn more about our services and cathodic protection installation that carry a 10 year guarantee. MATCOR offers the latest insights on anodes for cathodic protection, cathodic protection equipment and more. NextEra Energy Inc. (NEE)’s utility Florida Power & Light Co. said it’s requesting bids to build a third natural gas pipeline into Florida to meet growing demand from power generators. The approximately 700-mile (1,125-kilometer) pipeline would deliver gas from western Alabama to a new hub in Central Florida that would connect to FPL’s gas system in Martin County, the Juno Beach, Florida-based company said today in a statement. The line would deliver about 400 million cubic feet of gas a day starting in 2017, and would increase after that, the company said. Bids for the project, which will consist of two segments, are due by April 3, 2013, Richard Gibbs, a spokesman for FPL, said today in a telephone interview. 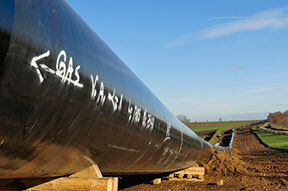 The “multibillion dollar” pipeline will need federal, state and local approvals, Gibbs said. Florida uses more natural gas to produce electricity than any U.S. state other than Texas and 60 percent of the state’s power is generated by gas plants, the company said. The release of a federal report detailing the cause of a 2010 pipeline rupture that spilled more than 800,000 gallons of oil in southern Michigan has been delayed. The report is expected to be released this fall, about six months later than expected, the Kalamazoo Gazette reported (http://bit.ly/zkCAau). The National Transportation Safety Board attributed the delay to other investigations into separate pipeline incidents. “Our investigations look at numerous aspects that could have played a role in the accident, such as maintenance, human factors, pipeline operations, and materials,” said NTSB spokesman Peter Knudson. The report about the July 2010 spill from Calgary, Alberta-based Enbridge Inc.’s pipeline also is expected to offer future safety recommendations for the pipeline industry. Enbridge said it will be able to finish its internal investigation after the report is released. Company spokesman Jason Manshum said the company is working to take what it’s learned from the spill and share that knowledge. “We’re focused on applying these lessons in our operations in all locations where we operate,” Manshum said. Cleanup efforts continue this year. The rupture was to a 30-inch pipeline carrying oil from Griffith, Ind., to Sarnia, Ontario. The oil spilled into the Kalamazoo River and Talmadge Creek near Marshall, about 60 east of Grand Rapids. Preliminary testing of the ruptured pipe found surface cracks and indications of corrosion. The Enbridge pipeline was installed in the 1960s and is part of a system that was eyed by federal officials prior to the leak. The Pipeline and Hazardous Materials Safety Administration has said that it warned Enbridge about potential problems including possible safety code violations related to monitoring pipeline corrosion. CALGARY – The regulatory panel weighing the controversial Northern Gateway oil pipeline said Tuesday it will likely make its decision in about two years, several months later than estimated by the builder, Calgary-based Enbridge Inc. The proposed 1,200-kilometre pipeline would ship oilsands crude from Alberta to Kitimat, B.C., where it would be loaded onto tankers that could transport it to Asia — providing exporters with alternatives to the United States, the biggest importer of Canadian crude. However, as with the Keystone XL pipeline that TransCanada Ltd. (TSX:TRP) hopes to build from Alberta to refineries along the Gulf Coast in the southern United States, Enbridge’s Northern Gateway proposal faces opposition on environmental and other grounds. Thousands of people are set to speak at hearings across northern British Columbia and Alberta between January of next year and April 2013. The joint review panel said Tuesday, in announcing several dates for the hearings, that it expects to release an environmental assessment report in the fall of 2013, and announce its final decision around the end of that year. Enbridge CEO Pat Daniel said in May he was anticipating an early 2013 decision, but it’s clear from the hearing schedule that won’t be the case. “We understand that there is significant public interest in the Northern Gateway project. The JRP seems to be ensuring that there is a thorough inclusive process, and we are supportive of that. We see value in a well-defined process and remain committed to the regulatory review,” Enbridge spokesman Paul Stanway said in an emailed statement. Enbridge also faces a longer review process than it expected for a proposal to reverse part of an oil pipeline in Ontario. The National Energy Board said Monday it will begin oral hearings this fall into Enbridge’s Line 9 proposal. Enbridge originally aimed to begin work on the $20-million Line 9 reversal project in early 2012, with start-up anticipated in the fall of next year. “While the schedule extends further into 2012 than we had anticipated, we respect the board’s desire to enable stakeholders and communities affected by the project to have the opportunity to participate in the regulatory review process,” Enbridge spokeswoman Jennifer Varey said in an earlier email Tuesday. Opposition to major pipeline projects has grown since the disastrous offshore spill in the Gulf of Mexico after BP’s leased Deepwater Horizon rig experienced a fatal explosion in April 2010. The pipeline industry’s reputation as a relatively reliable and environmentally safe way to transport oil was tarnished by a much smaller spill in July 2010, involving an Enbridge pipeline in southern Michigan. There have also been periodic small-scale leaks at the original Keystone pipeline and a major spill at the Rainbow pipeline in northern Alberta operated by Plains Midstream Canada.